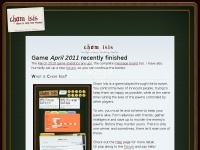 Chom Isis is a free browser game where players take the role of members of a select club, controlling the life of unsupecting members of the general public. The websites creator or author is R. I. W. Lang. Copyright 1990 onwards R. I. W. Lang is the owner of the copyright for this website. The web server with the IP-address 178.79.142.122 used by Chomisis.net is run by Linode and is located in Great Britain. The server runs exclusively the website Chomisis.net. The websites of Chomisis.net are served by a Apache web server using the operating system Ubuntu (Linux). The software used to serve the webpages was created by using the programming language PHP. XHTML 1.0 Strict is used as markup language on the webpages. The website does not specify details about the inclusion of its content in search engines. For this reason the content will be included by search engines.